Typically, the bride and bridesmaids’ jewelry ensembles are made up of a necklace and earrings, but they can also include brooches and bracelets or cuffs, depending on the formality of the wedding, how elaborate the dresses are, and the bride’s preferences. In any case, there are several ways to match the cost to your budget. 1. Make the jewelry “something borrowed.” One way to slash bridal jewelry from the budget is to borrow it. If someone you know already owns a piece you love, and if it works with your wedding dress and hairstyle, borrow it to wear on your big day. 2. Wear an heirloom necklace, earrings, or other jewelry. Another no-cost solution is to wear a piece handed down from a family member as the “something old” in your wedding. – Look at only inexpensive jewelry. Skip the upscale pearls, diamonds, 24K gold, and platinum and home in on jewelry made from more affordable materials such as freshwater or man-made pearls, imperfect diamonds, cubic zirconium or crystals (which generally looks much better than low-grade diamonds), affordable gemstones, silver, 10K–14K gold, titanium, tungsten, and stainless steel. – Figure out what you like about a specific expensive piece; then, look for more affordable jewelry with similar features. 5. Make your own jewelry. If you have talent and fine-motor skills, or you know someone who has them, making your own jewelry is an attractive option. You can buy crystals, beads and other supplies at specialty merchants. Be sure to leave enough time to practice making quality jewelry and for experimenting. 7. Receive your jewelry as an early wedding gift. 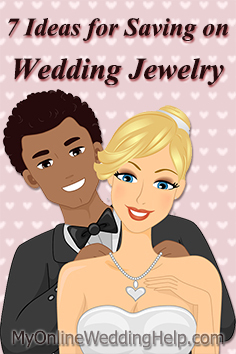 Just like anything else related to your wedding, you can ask for jewelry as an early wedding gift. You can also help the bridesmaids save by giving them their jewelry as a gift.